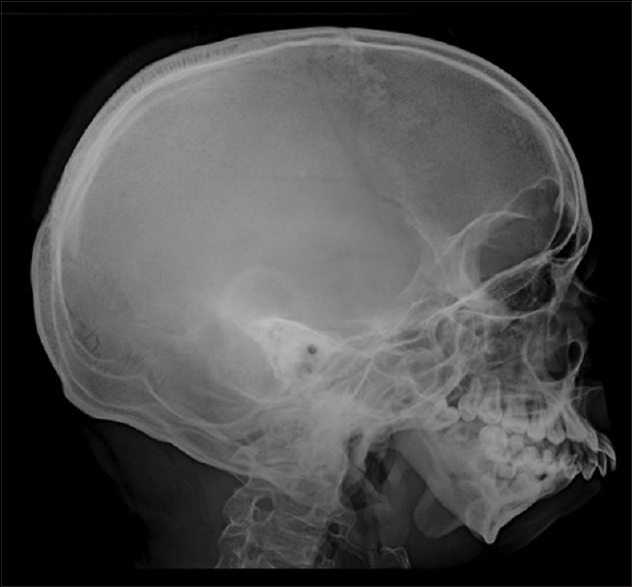 A 20-year-old male reported to the oral medicine and radiology department with a chief complaint of the underdeveloped lower jaw, which was first noticed during childhood and gradually progressed. There was no history of any trauma or any systemic diseases during birth. Patient's parents gave a history of consanguineous marriage. There was no family history of the present problem. The general physical examination did not reveal any abnormalities. The vital signs were within normal limits. 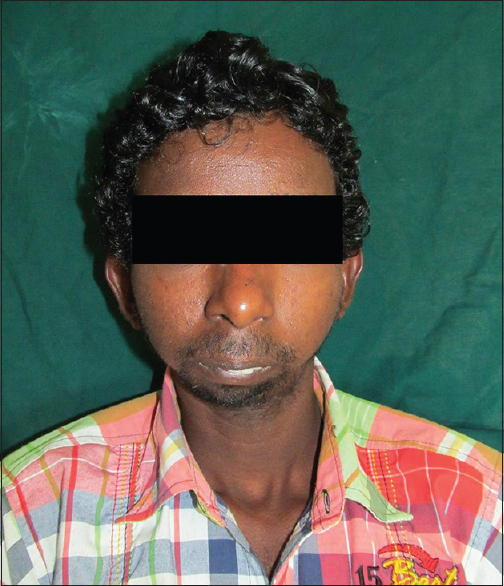 Extraoral examination revealed facial asymmetry with severe retruded mandible [Figure 1] and [Figure 2]. Mouth opening was restricted (25 mm) with no deviation or deflection [Figure 3]. Condyles were not palpable on both sides. Intraorally there was crowding in upper and lower anterior teeth with increased overjet and overbite. The molar relation was angles class II bilaterally. Deep palate was also seen. No other important clinical extraoral or intraoral findings were observed. Based on clinical findings, a provisional diagnosis of bilateral ankylosis and differential diagnosis of bilateral condylar hypoplasia or aplasia were given. After clinical examination, radiographic examinations were performed. Panoramic radiograph showed complete absence of condyle on the right side and left a side. Glenoid fossa was not developed on both sides. Ramus and body of the left side were comparatively smaller than the right side. Antigonial notch was prominent bilaterally [Figure 4]. Posterioanterior view showed facial asymmetry [Figure 5]. Lateral skull views showed severe retruded and micrognathic mandible [Figure 6]. Condylar aplasia on right and left sides was confirmed by reverse town and transpharngeal views. Computer tomography (CT) was advised for additional information. 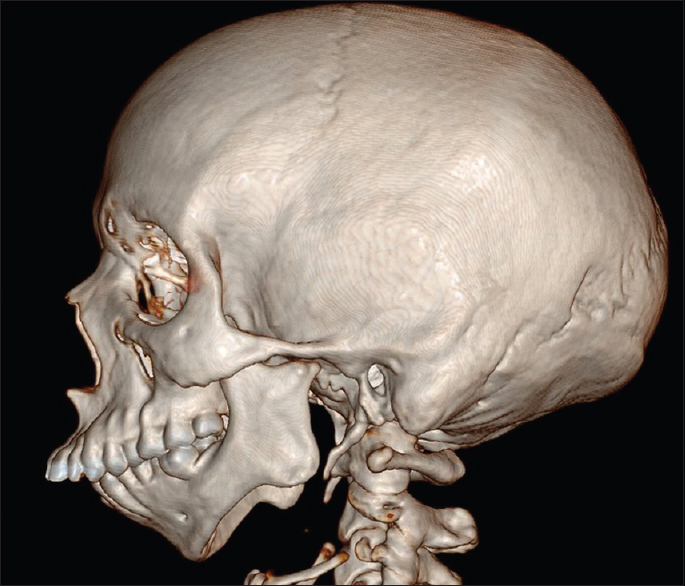 3D CT showed complete condylar aplasia on the left side and condylar aplasia with two bony projections on right side [Figure 7], [Figure 8], [Figure 9], [Figure 10]. 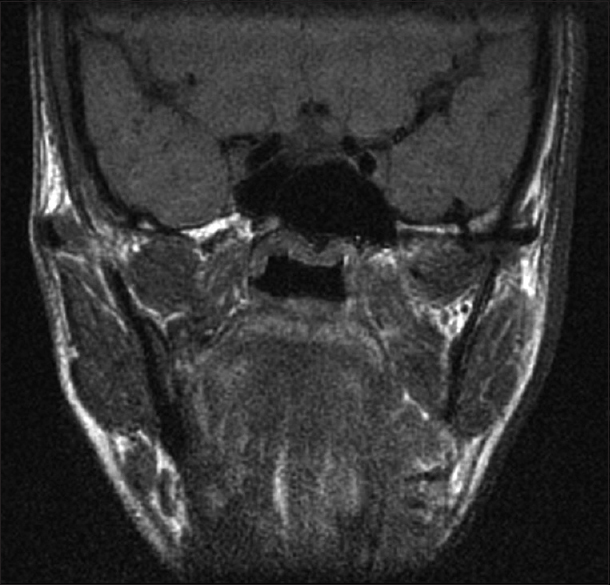 Magnetic resonance imaging showed complete absence of articular disc bilaterally [Figure 11]. 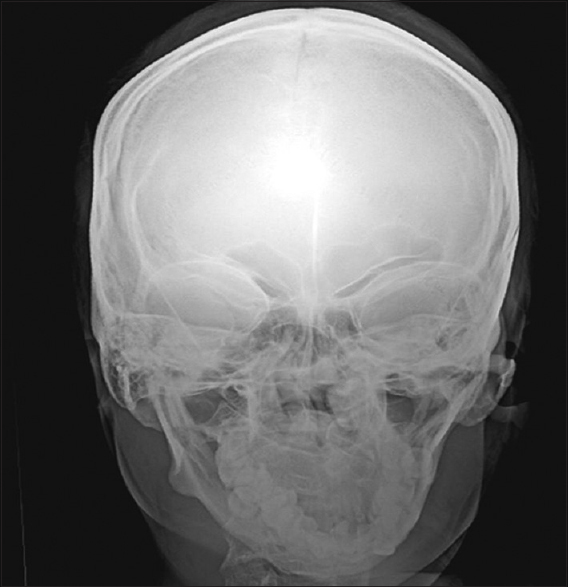 After radiographic confirmation, patient was advised complete systemic evaluation and referred to General medicine, cardiology, ophthalmology, ear, nose, and throat and orthopedics to rule out any syndromes. The medical evaluation revealed no abnormalities. Based on the clinical and radiographic findings, a final diagnosis of nonsyndromic agenesis of right and left condyle was given. Patient was referred to oral surgeon and orthodontist for the best possible treatment. In a newborn child, the TMJ is mobile. After the eruption of the first permanent dentition at the age of 7 years, the articular eminence begins to be prominent, and its development continues at an accelerated pace until 12 years of age. If a condyle is present, an adaptive well-defined fossa and articular eminence should be present. Hence, in the case of the absence of a condyle, those coherent structures should also be absent. , In our case, the complete absence of the right and left condyle and glenoid fossa were observed. 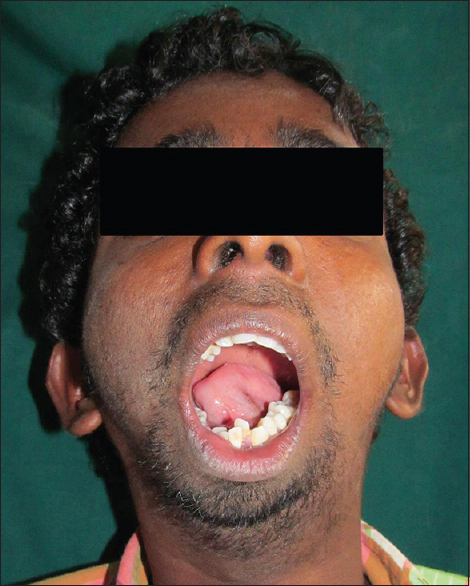 Aplasia of the mandibular condyle without any other facial malformations is an extremely rare condition. There are very less cases of nonsyndromic mandibular condyle aplasia reported. ,,,,,, Our case also presented condylar aplasia without any other features suggestive of any syndrome. Nonsyndromic condylar hypoplasia and aplasia are exceedingly rare conditions. We report a rare case of bilateral total condylar aplasia, not related to any pathological disorder. This condition should be separated from different associated syndromes based on different clinical features and investigations. A very few case reports are published in the literature, to date. Hence, our case is very special in this aspect. Kaneyama K, Segami N, Hatta T. Congenital deformities and developmental abnormalities of the mandibular condyle in the temporomandibular joint. Congenit Anom (Kyoto) 2008;48:118-25. Buchbinder D, Kaplan AS. Biology. In: Kaplan AS, Assael LA, editors. Temporomandibular Disorders Diagnosis and Treatment. Philadelphia, PA: Saunders; 1991. p. 11-23. Choi JW, Kim JT, Park JH, Park EK, Kim SY, Kwon TG, et al. Gp130 is important for the normal morphogenesis of Meckel′s cartilage and subsequent mandibular development. Exp Mol Med 2007;39:295-303. Cleall JF. Postnatal craniofacial growth and development. In: Laskin DM, editor. Oral and Maxillofacial Surgery. Vol. 1. St. Louis: Mosby; 1980. p. 70-107. Pruzansky S. Postnatal development of craniofacial malformations. J Dent Res 1968;47:936. DeLone DR, Brown WD, Gentry LR. 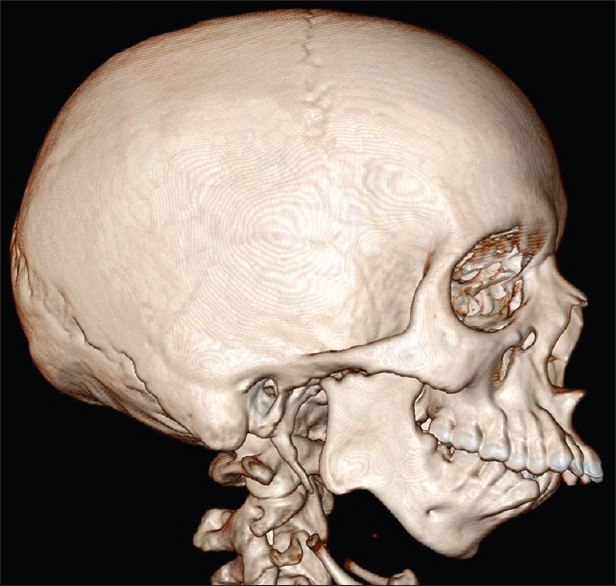 Proteus syndrome: Craniofacial and cerebral MRI. Neuroradiology 1999;41:840-3. Morgan KA, Rehman MA, Schwartz RE. Morquio′s syndrome and its anaesthetic considerations. Paediatr Anaesth 2002;12:641-4. Ozturk S, Sengezer M, Isik S, Gul D, Zor F. The correction of auricular and mandibular deformities in auriculo-condylar syndrome. J Craniofac Surg 2005;16:489-92. Krogstad O. Aplasia of the mandibular condyle. Eur J Orthod 1997;19:483-9. Shibata S, Suda N, Fukada K, Ohyama K, Yamashita Y, Hammond VE. Mandibular coronoid process in parathyroid hormone-related protein-deficient mice shows ectopic cartilage formation accompanied by abnormal bone modeling. Anat Embryol (Berl) 2003;207:35-44. Gorlin RJ, Cohen MM, Hennekan RC. 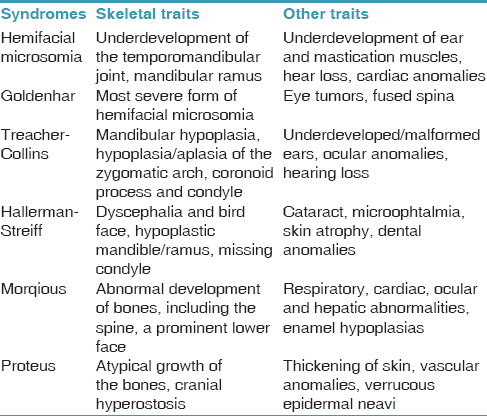 Syndromes of Head and Neck. 4 th ed. New York: Oxford University Press; 2001. Sperber GH. Temporomandibular Joint. In Craniofacial Development Hamilton. Ontariop: BC Decker Inc.; 2001. p. 17-8. Prowler JR, Glassman S. Agenesis of the mandibular condyles; diagnostic findings and treatment of deformity by polyethylene implant. Oral Surg Oral Med Oral Pathol 1954;7:133-9. 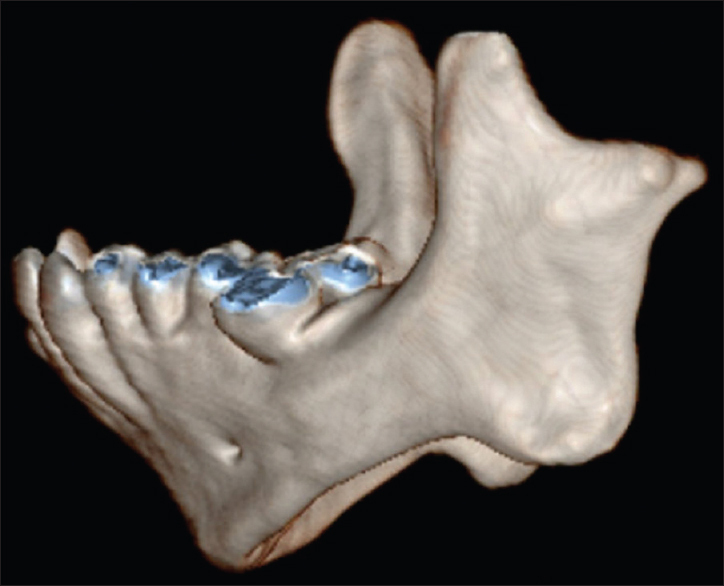 Akihiko I, Ritsuo T, Junichi F, Nobuyuki I, Yutaka T. Agenesis of bilateral mandibular condyle-report of a case. J Jpn Stomatol Soc 2006;55:187-92. Santos KC, Dutra ME, Costa C, Lascala CA, Lascala CE, de Oliveira JX. 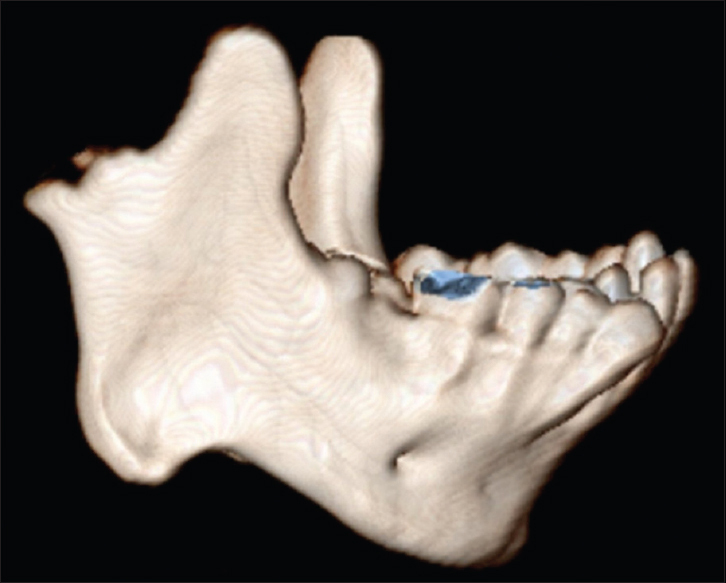 Aplasia of the mandibular condyle. Dentomaxillofac Radiol 2007;36:420-2. Bowden CM Jr, Kohn MW. 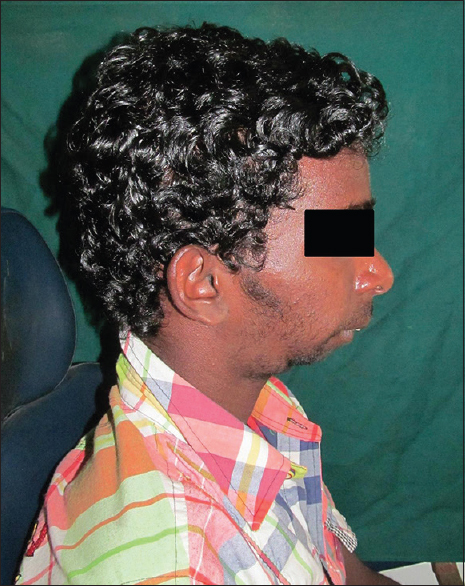 Mandibular deformity associated with unilateral absence of the condyle. J Oral Surg 1973;31:469-72. Canger EM, Celenk P. Aplasia of the mandibular condyle associated with some orthopaedic abnormalities. Dentomaxillofac Radiol 2012;41:259-63. Shivhare P, Shankarnarayan L, Jambunath U, Kumar M, Sowbhagya MB. Condylar aplasia and hypoplasia: A rare case. Case Rep Dent 2013;2013:745602. Vargervik K, Kaban LB. Hemifacial microstomia diagnosis and management. In: Bell WH, editor. Modern Practice in Orthognathic and Reconstructive Surgery. Vol. 2. Philadelphia: W.B. Saunders Company; 1992. p. 1533-60.